After completing my 6-day bike tour around the Isle of Man, I took a ferry boat back to Dublin, Ireland and then began cycling south toward the Wicklow Mountains and Wicklow National Park. Because I now had approximately 10 days to kill before my friends met me in Dublin and we traveled around Ireland together in a rental car, I didn’t want to stray too far from the Dublin area. Plus, I was pretty tired after having been on the road for more than three months straight. So I decided to use the Wicklow Mountains as my base for the next 10 days, and slowly cycle around the area, sleep in the forests each night, and see as much of the Wicklow National Park as I possibly could. After the ferry boat from the Isle of Man landed in Dublin, Ireland, I cycled south out of the port, across the city, and down through the neighboring suburbs of Ballsbridge, Blackrock, Killiney, Ballybrack and Bray. Then I turned south-west and headed inland toward the city of Roundwood on the R755. This is when the hills began… and boy were some of those hills steep! It wasn’t until I hit the hills that I began to realize just how tired I was. I had woken up around 5:30 AM that morning in order to catch the 7 AM ferry from the Isle of Man back to Dublin… and so I was already pretty exhausted. Cycling up those steep, windy roads near Roundwood made me even more tired though. I stopped dozens of times along the way to rest and rehydrate. I was exhausted. I pulled my bike to the side of the road and spoke for a while with Jeff – one of the readers here at BicycleTouringPro.com. 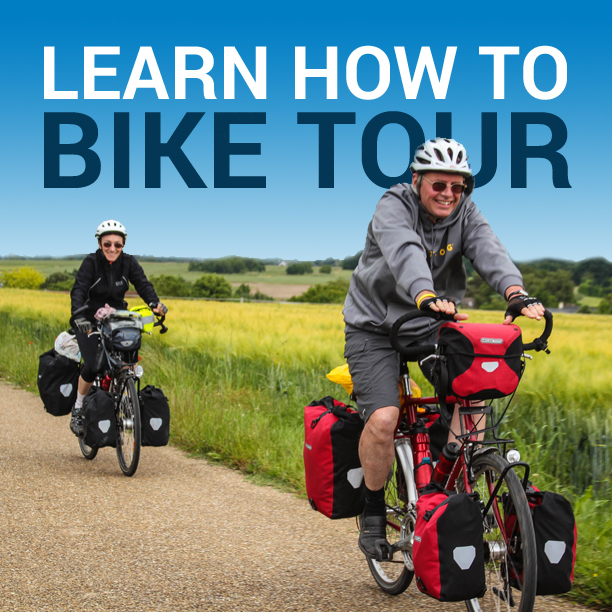 Jeff told me that he had recently gotten into bicycle touring, had just completed his first bike tour in Denmark, and was in the process of planning his second bicycle tour. I thanked Jeff for stopping to say hello and then we continued on our separate ways. It’s rare that I am stopped on my travels by a stranger who knows me from the website here, but it does occasionally happen, and I love it when it does. After leaving Jeff, I cycled up the steepest of all the hills I would encounter in Ireland. I was totally beat by the time I reached the top and I continued cycling for another 10 kilometers or so after that. Using an offline mapping application on my smartphone, I was able to spot an area in the nearby hills where I thought I might be able to secure a camping spot for the evening. So I pushed my bicycle up a steep gravel road for several hundred meters and after more than thirty minutes of searching, finally settled on a relatively flat stretch of land near the top of the mountain. I set up my tent and crawled inside, just as it began to rain. I slept incredibly well that night and woke the following morning feeling completely refreshed. I packed up my bike and cycled down the steep hill I had climbed the previous evening. My brakes squealed as I pulled into the tiny roadside market in the village of Laragh and I loaded up on food and water for the rest of the day. Then I cycled west on the R756 toward nearby Glendalough (also known as Glendaloch). Glendalough is a small glacial valley in the Wicklow Mountains renowned for its Early Medieval monastic settlement founded in the 6th century by St. Kevin, a hermit priest, and partly destroyed in 1398 by English troops. Because I was just killing time at this point in my travels around Europe, I decided to spend the entire day in the Glendalough area. I sat by the lake and ate lunch, went for a hike up to one of the nearby waterfalls, and sat for hours watching the tourists pass by as I read my book and plotted out the rest of my travels on my smartphone. Sometime around 4 PM, I left the Glendalough valley and cycled south about 13 kilometers to the nearby city of Rathdrum. Once there, I stopped briefly to fill up my water bottles and load up on food, and then I cycled north out of the city along Ballinderry road. When the road came to the end of the road, I jumped a fence and cycled into the forest near the top of the mountain and made camp in a small grouping of trees about a kilometer away from the main roadway. Setting up my tent, I knew that this remote campsite would be my home in the woods for at least the next three or four nights. After a cold, but peaceful night of sleeping in the woods, I woke early the following morning and cycled down into the city of Rathdrum once again. Once there, I visited the library, which was only open for two short hours. I used the opportunity to do a small amount of computer work and, more importantly, to recharge the batteries on my laptop computer, smartphone and backup batteries. The following day, I returned to the library once more and worked the entire day on my computer, getting my batteries charged all the way up and planning the next leg of my trip (a visit to the UK and Romania). The librarian at the Rathdrum Library was far from welcoming and it was a little uncomfortable working with her in such a tight space (the library there in Rathdrum is incredibly small – just a single room only big enough for about 12-16 people max). Rather than return to the library the following day, I stayed in the forest where my tent was pitched and went on a long hike into the nearby hills. Just as I reached the peak of the mountain, it began to downpour and I ran back to my tent, drenched from head to toe by the time I was able to climb inside the safety of my tiny weatherproof nest. At this point in my travels, it had been more than 10 days since I last had a shower. The time eventually came, however, for me to leave the Rathdrum area and make my way back to Dublin. After meeting Jeff (the BicycleTouringPro.com reader who had recognized me as he drove past just a few days before), I decided to send him an email and see if he’d be willing to let me sleep and shower at his home in Dublin for a night or two while I waited for my friends to arrive in the city. I now had only three nights to kill, so I sent the email off and was delighted when I heard back from him saying that he would indeed be able to host me for two evenings. With news that a shower and a warm house awaited me, I cycled out of my hidden hillside forest campsite and made my way back to the main road with my fully-loaded touring bicycle. Then I cycled north, back in the direction I had come, toward Glendalough and up the R115 into the heart of the Wicklow Mountains. The road to the summit wasn’t nearly as steep as I thought it might be, so the kilometers flew by rather quickly. Along the way I stopped to take photos of a rushing waterfall, grazing sheep, and myself cycling through several scenic areas. I even spotted a small red fox along the way (but was unable to get a photo of it). 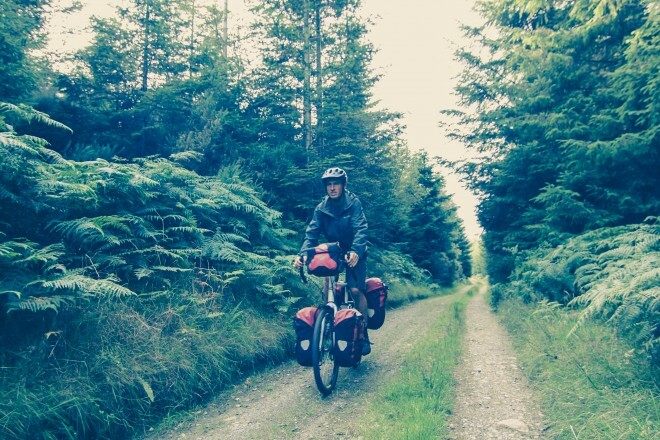 These photos make Wicklow National Park look like some kind of bicycle touring dreamland. But let me tell you, the roads surrounding Wicklow are steep, and the wind and weather (I’m talking about RAIN) at the top can be incredibly fierce. I know I’m smiling in the photo below, but I was cold and the wind was blowing like crazy! It was great fun, but it wasn’t always easy. Even with the poor weather (which would remain with me the entire time I was in Ireland), I have to admit that my last day in the Wicklow Mountains was pretty spectacular. In fact, the bike ride from Glendalough to Dublin along the R115 was easily the best day of cycling I experienced during my three weeks in Ireland. It was cold, wet and windy, but the scenery was spectacular and there were very few cars on the road. Just as I was about to reach Dublin and cycle down the last major hill that would lead me from the isolated mountain tops of Wicklow into the crowded city center of Ireland’s capital city, the sun came out and I was treated to a wonderful blue sky. It was so very much appreciated! As I flew downhill into Dublin’s center, I passed several other cyclists straining to get up the long steep hill that leads into Wicklow. I smiled as they pedaled past, knowing that they would eventually make it to the top and soon be rewarded with some of the most scenic landscapes in all of Ireland. This entry was posted in Bicycle Touring Pro Articles, Darren Alff's Bike Tour Blog, Europe, Featured Articles, Ireland, Locations, Main Articles, Photos and tagged bicycle touring in ireland, camping in wicklow, cycling trails around dubline ireland, cycling wicklow, dublin bike tours, glendaloch, glendalough, ireland bicycle tours, ireland bike tours, ireland cycle tours, rathdrum library, wicklow, wicklow mountains. Thanks Mike! I can’t wait to start following your journey. When do you set sail? Nope. Never been to Indonesia… but maybe I’ll get there sometime soon. Maybe.